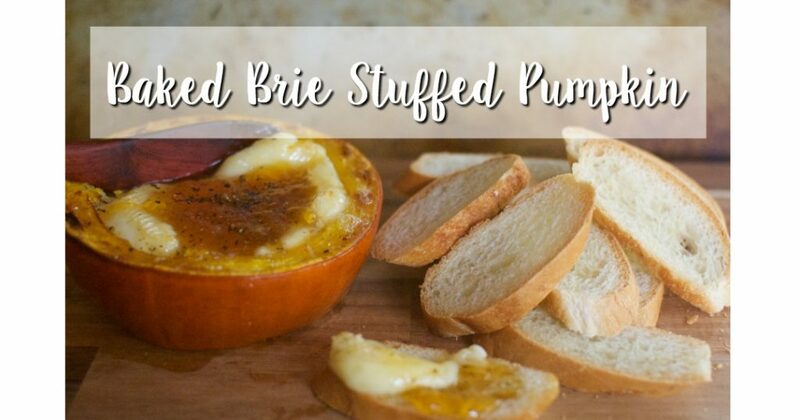 Turn your favorite baked brie recipe into the cutest fall appetizer by stuffing it into a pumpkin! 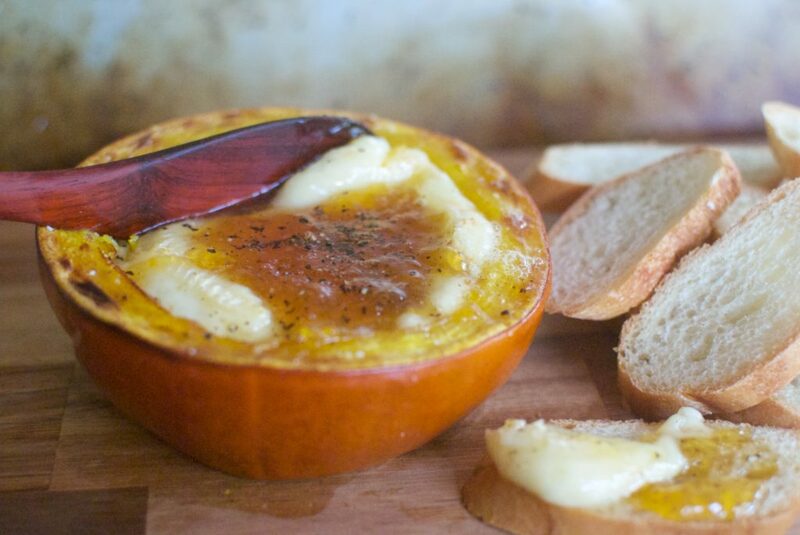 I love baked brie — it’s kind of a Fall-ish appetizer that leads right into the holidays. However, this ‘usual’ recipe I wanted to be a bit more exciting, and after stuffing cheese and bread into my Pumpkin Fondue, I wanted to stuff every pumpkin I had…. And it’s way different than brie en croute, since this helps out our gluten free friends! This easy baked brie appetizer recipe would be perfect fall gatherings, tailgating (you can keep it warm in a low crockpot! ), even a brunch! This pumpkin is from Trader Joe’s — what they call ‘Sugar Pumpkin’ – as you can see, it;s the size of a wheel of brie, but the center is so creamy sweet, it pairs perfectly well. 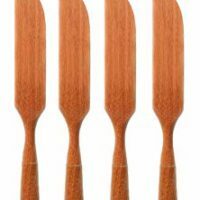 You could also top with all kinds of preserves, not just the apricot preserves I used. Hot pepper jelly would be delicious, especially if you’re planning to be outside on a chilly night — it will warm you right up! One major point: I removed the rind from the entire wheel, before adding to the hollowed pumpkin. This helps it melt, and get ooey gooey quickly — turning this into a dip recipe almost? You’ll have to try it to see! I promise, you won’t be disappointed. 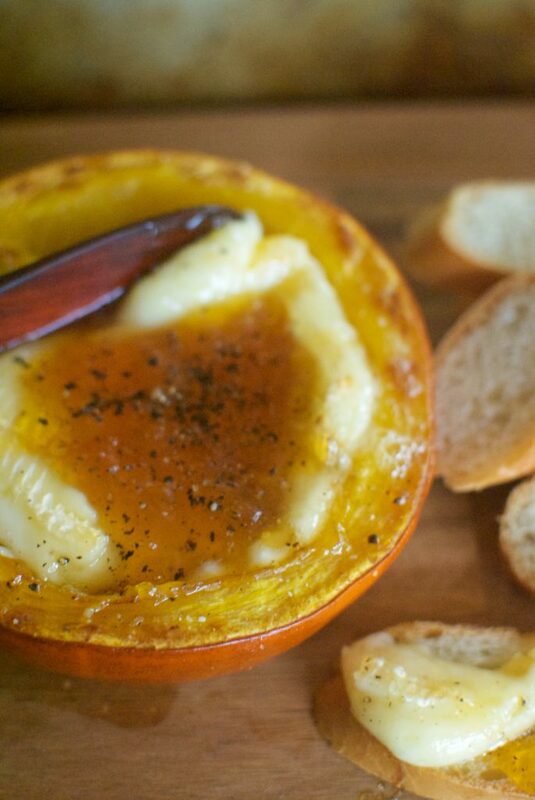 It’s cheese inside a pumpkin, with sweet preserves — what’s not to love?! 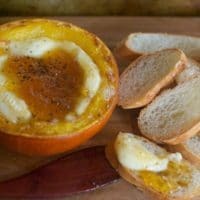 One of the greatest 'dessert cheeses,' brie has been stuffed into a pumpkin and topped with apricot preserves. Making this a #winning appetizer for any Fall holiday get together. Even is that means a Tuesday night with yourself. Slice pumpkin, so you have a "bowl" that will fit your brie wheel. Remove seeds and fibers. Paint the inside of the pumpkin with olive oil, and place on baking sheet. Bake pumpkin in preheating oven, while you remove the rind from brie wheel. Carefully! Remove the rind from your wheel of brie. 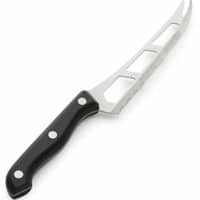 I like to use a serrated cheese knife, and 'saw' back forth very gently. Remove pumpkin from oven, and stuff cheese into it. If it doesn't fit, feel free to cut the brie into pieces, it will melt anyways! 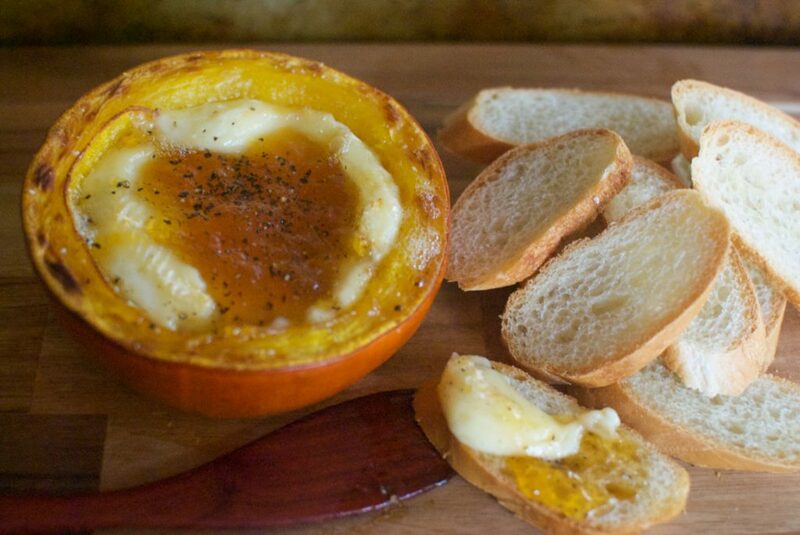 Cover brie with apricot preserves. Then, cover the entire pumpkin with foil. Best part: the pumpkin acts like a warmer, and keeps your cheese warm longer than the other way! 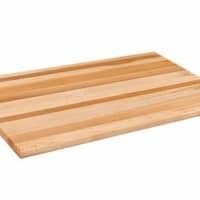 You can save this pin to your favorite appetizer of thanksgiving board! Cheers to gathering your people around a pumpkin stuffed with brie!